Any "Remote Control Base" purchase gives you free access to this software for free. General Information about Multi-Cam Software. What can I do with Multi-Cam Software? What your system requires for various setups and cameras. Notes on the installation of Multi-Cam Software. Guide to using Multi-Cam Software. Add a camera to the display. Guide to Fine tuning Multi-Cam Software's Operation. Multi-Cam Software is software that allows you to view and control multiple cameras at the same time on the same screen. Each individual screen display in Multi-Cam Software has features which allow you to detect and track motion. The system can capture stills of the selected input display, as well as capture surveillance videos, and replay them using the [surveillance viewer]. When the system is installed, you can watch and access all of your cameras, and control the Pan/Tilt/Zoom on all cameras that are attached to a Remote Control Base. Multi-Cam Software is a digital video recording and surveillance monitoring system. With Multi-Cam Software, you can connect to multiple cameras from the same graphical user interface, while maintaining individual settings for all the separate video feeds. Multi-Cam Software allows for multiple recordings to occur at the same time from different video feeds into separate files on your computer's hard drive. The frame rate for recoding is also adjustable and the user is able to set a limit for hard drive space used. This allows you to capture video to disk only when there is motion. You can individually set each camera to capture after a certain amount of motion has been detected. You can change the Display screen to suit your individual needs, with various placements for each video display. Each video feed can be selected and highlighted as the main feed or put onto the side as a sub-feed. more surveillance on a single screen. There is no longer a need to change tapes or rewind/forward to find footage. From within Multi-Cam Software or any time, use the Surveillance Viewer to instantly access video and still frames by selecting date/time and sliding your cursor back and forth along the time scale at any speed. Works with computers running Windows® 98 Second Edition, Millennium Edition, 2000, and XP operating systems. At least one Remote Control BaseTM (on the first camera) is required to unlock video capture. Macintosh: All our software only works with Windows based PC's, sorry it doesn't support Macintosh. 128MB of system memory and 20MB of free space on your hard drive is required. 256MB is recommended for 4 video feeds and below. For more video feeds, 512MB is recommended for best performance. Each camera will typically require approximately 30GB of disk space for each week of video surveillance capture. Results will vary depending on frame rate and amount of motion. Minimum requirement of Pentium. II 400MHz. For best performance, with 4 video feeds and below, a Pentium. III 733MHz is recommended. For the more video feeds, an Intel/AMD processor beyond 1.4GHz is recommended. Remote Control BaseTM is a USB 1.1 compatible device and it can be used on a USB 2.0 port. Some USB hubs do no provide enough current to power the Remote Control BaseTM. We recommend connecting directly to a USB port on your computer. Multi-Cam Software is compatible with WDM cameras including USB (1.1 and above), Firewire (also called IEEE 1394 or i.Link), and most analog cameras connected to a capture card with WDM drivers. Avoid USB cameras that do not support more than one device at a time. Also for analog camera support, we recommend the use of Hauppauge® WinTV-Go Model 700 capture card. 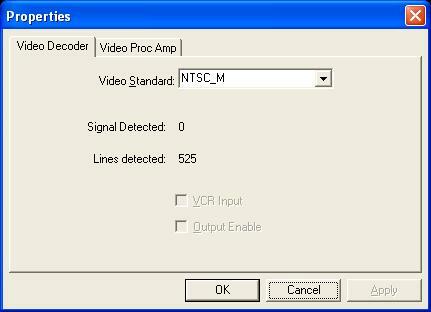 Multi-Cam Software includes special code to support multiple Hauppauge® cards. Have your Windows CD handy and plug Remote Control BaseTM into a free USB port or hub using the supplied cable. Install software by inserting the Multi-Cam Software CD or from folder and running setup.exe, (if it doesn't start up automatically). If you downloaded the software, simply run the downloaded file. Follow the on-screen instructions given by the setup program. In Windows 2000 and XP, you may be asked a question about installing a driver. Please click on Continue. If required, the setup program will give you the option of restarting your computer to enable certain features. Multi-Cam Software software requires some previous software configuration experience. But don't worry, all the features and options will be examined throughout the duration of this help file. 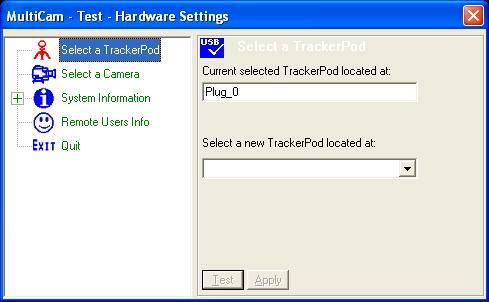 TrackerCam. and Multi-Cam Software can not be run simultaneously on the same computer, so please be sure to turn off TrackerCam if you intend to run Multi-Cam Software. For security reasons, software setting changes require a password. 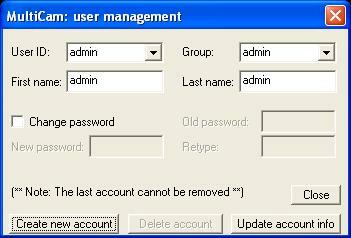 By default a login called "admin" has been created with password "admin". You should change this password in User Management (see Figure 1). The very first thing you should do is add a camera/Remote Control BaseTM to the display. Click on the [Add Camera]button. Input a name that you wish for the camera feed. There should also be two options, one for a [Local Camera] (Fig. 3) and another for [Remote Camera] (Fig. 4) . If your camera is connected directly to your computer or via a USB hub, select [Local Camera]. If the camera is located on another computer, obtain the address and port number of the camera as well as login/password and select the [Remote Camera] option. Now that you have your setup for a camera done, a section of the Multi-Cam Software should now display the newly added camera/Remote Control BaseTM. At the top right of the display there should be a small box with three lines, click on it once to get a menu for the setting of the camera. The Hardware configuration (Fig. 5) allows the user to view and change the currently selected Remote Control BaseTM and the video feed. All the software configuration option screens include full explanations. See the Software Settings section for detailed information. 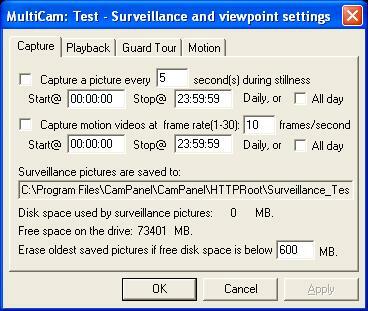 The surveillance videos can be accessed by using the [Surveillance Viewer], which can be opened from the same window as above. 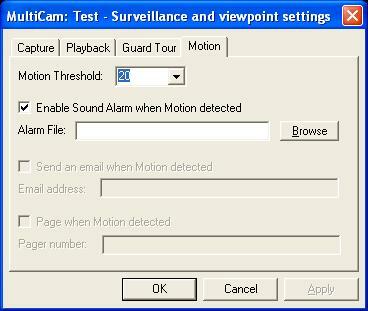 Choose the [Playback] tab and select the button labeled [Surveillance Viewer] (Fig. 7). 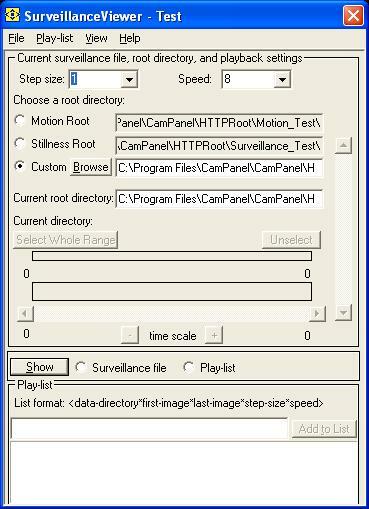 The Surveillance Viewer can also be run directly from Windows Explorer anytime. The Remote Control BaseTM attached to the selected camera can be controlled via the up, down, left, right arrow keys. You can also control the digital zoom feature by using the + and - keys. Another option is Mouse Movement: Holding the left mouse button down while the mouse is over the video window lets you move the camera by dragging the mouse. Software Settings let you adjust Multi-Cam Software and Remote Control BaseTM's advanced settings. The setup defaults are reasonable for most users. Each section has detailed explanations of all the options and features. Note: You must click the top left corner of a video window and select Software Settings to access the following pages. Save or restore current or startup settings, change settings and save them. Set user privileges, on/off line, surveillance, see connected users. Select camera, specify field of view. Set tracking speed, timeout, viewpoint order. Select a Remote Control BaseTM, set home position, motor limits, step size, timeout, lights.